So you got your Open Water and are not sure what to do next? This program allows you to experience five different SSI Specialty programs without requiring you to complete the entire Specialty. With all of the different diving opportunities around Malta, and the various specialties we offer at our centre on Gozo, this is the perfect way to advance your diving and to identify which Specialty programs interest you. 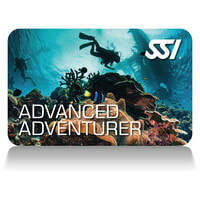 With the help of our experienced instructors you will earn the SSI Advanced Adventurer certification and have a better idea of where you want your diving to take you.